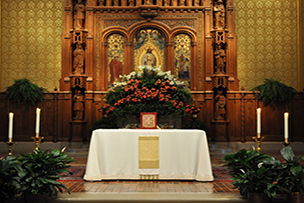 We invite all parishioners and friends of the parish to join us for Sunday Mass and on weekdays. Check the Mass schedule printed below. Our liturgies give us a wonderful opportunity to praise God through the proclamation of the Word and the celebration of the Sacrament. Come with an open heart to join your voices as one in recited and sung prayer to the Lord. © 2019 Catharine of Siena.